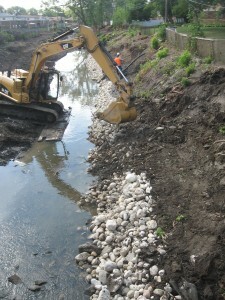 Silver Creek Stream Stabilization – Phase III | ENCAP, Inc. 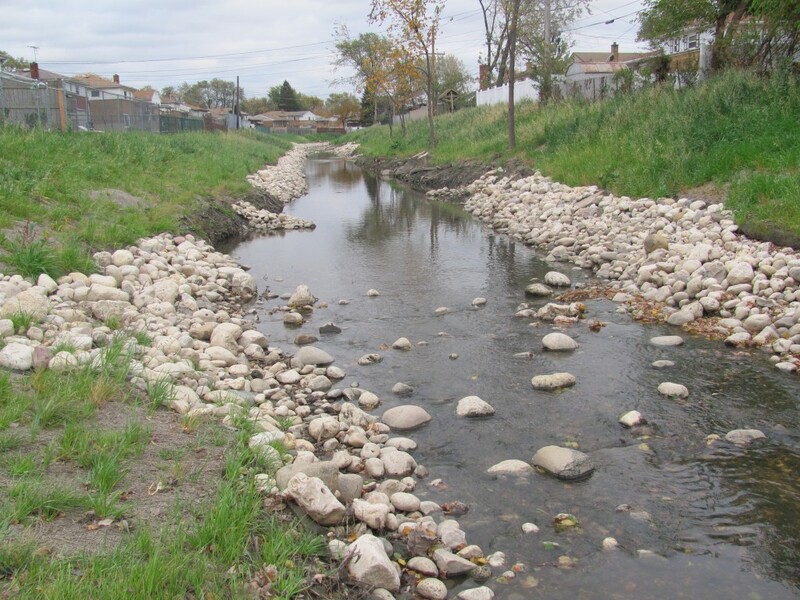 The Silver Creek Streambank Stabilization-Phase III project was performed for the Village of Melrose Park. ENCAP, Inc. was contracted to complete this challenging streambank stabilization project. 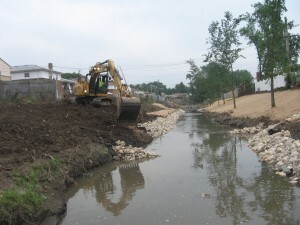 Involving a lower reach of Silver Creek which drains directly into the Des Plaines River in Cook County, this project involved restoring over 1,200 feet of highly eroded stream channel in a heavily urbanized area. The following article was written by Jonathan Koepke, CPESC, General Manager at ENCAP, Inc., and was published in Stormwater Solutions Magazine in 2011. 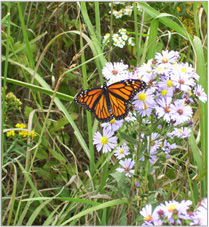 Urbanization and land development in the 1930s-1960s in the near western suburbs of the Chicago Region has lead to a significant impact on the ecology and hydrology of the Des Plaines River watershed. A tributary to the Des Plaines River known as Silver Creek runs in back of and between industrial parks, shopping malls, roadways, and residences as it makes its way to the Des Plaines River. Over the course of the last thirty to forty years, the downstream sections of Silver Creek have experiences significant erosion including channel scour and stream bank loss. Because much of this section of the creek runs behind and adjacent to homes, streambank erosion was of serious concern to residents and the Village of Melrose Park. The Village of Melrose Park chose to resolve the ongoing streambank erosion problems. They turned to Ted Gray, Stream Engineer and Fluvial Geomorphologist with Living Waters Consultants, Inc. in Oakbrook Terrace, IL. Ted has many years of design, consultation, and construction supervision experience in working with streams in Northeast Illinois, and in particular streams in urbanized settings. The Silver Creek Phase III project was designed to provide long term, environmentally sound solutions for stream management in an urban setting. For that, a diverse series of stream stabilization practices were included in the design and installation including Rock Toe, Bank Slope Shaping, Vegetated Geogrid, Fiber Roll Terraces, Rock Points, Rock Riffles, Erosion Control Blanketing, and native plantings. The design preparation included working with significant challenges. The variety of practices implemented on this project was necessary to ensure that the challenging conditions imposed by the stream dynamics and watershed were addressed in a cost-effective way. One existing challenge that had to be addressed was the very limited access to the work area due to encroachment of homes, loss of bank soils, and a high density of trees and woody debris along the creek corridor. The majority of the work area was densely wooded with large diameter cottonwood, willow, elm, and maple species. These undesirable species had contributed to the stream erosion by shading out native vegetation along the banks and creating debris jams. Cutting and removal of nearly all of the woody species and removing the existing fallen trees and debris was a necessary first step in constructing the project. The steep slopes along the creek corridor and heavily eroded banks made traversing the work area difficult by foot and nearly impossible by machine. Additionally, permit restrictions on construction activity required that no equipment could operate in flowing water. The contractor on the project, ENCAP, Inc. in DeKalb, Illinois used a variety of innovative techniques to construct the project. Through the use of temporary piped stream crossings, benched access routes, and utilization of heavy duty timber mats to keep equipment out of the flowing water while constructing the project, ENCAP was able to construct the project efficiently while still maintaining permit compliance. The most critical portion of the project was just downstream of a major bridge crossing on an outside meander of the creek. A nearly vertical eroded bank had been created nearly six feet in height. In order to restore this portion of creek bank, a series of soil lifts were reconstructed in this 200 foot section of bank utilizing uniaxial geogrid reinforcement of the backfill material used to reconstruct the slope. In addition, a geogrid soil lift was constructed just above the rock toe stabilization utilizing a three dimensional combination erosion control and turf reinforcement matting. The face of the soil lift and the remaining slope was seeded with a specialized native seed mixture specific to this project. The upper portions of the slope and the regarded slopes were then seeded and stabilized using a bionet straw coconut erosion blanket. Within 24 hours of construction of this critical section of the project area described above, an extremely severe thunderstorm dropped nearly six inches of rain on the project within a time span of a few hours. The result caused flood depths of nearly 8 feet above base flow, with massive flooding of the work area. To the satisfaction of the contractor, engineer, and Village of Melrose Park, the project withstood the flooding with no damage, at a time when it was at its weakest. This was truly a testament to the power of design and proper construction. This project, as all successful projects, involved proper and thorough planning and design, collaboration between stakeholders, and the coordination of regulatory agencies, the designer, residents, municipal officials, and the contractor. Ultimately the result is reduction of nonpoint source pollution, improved water quality in the stream reach and downstream watershed, improved habitat and stream structure, and an improved aesthetics along the stream corridor. This project was constructed utilizing matching funds through Illinois EPA from Section 319 of the Federal Clean Water Act and the balance of funds coming from the Village of Melrose Park.